This Colonial Revival estate was the home of writer/director Victor Heerman and his wife, screen writer Sarah Mason Heerman. The Heermans won an Academy Award in 1933 for their screen adaptation of Luisa May Alcott’s “Little Women.” Originally built circa 1908, house and carriage barn were probably constructed by the first owner, Matthew O. Tremain, who was a carpenter and a real estate speculator. He and his family lived there until 1919, when it was sold to James N. Irving, who hired the firm of Albert Raymond Walker and Percy Augustus Eisen to remodel the house. 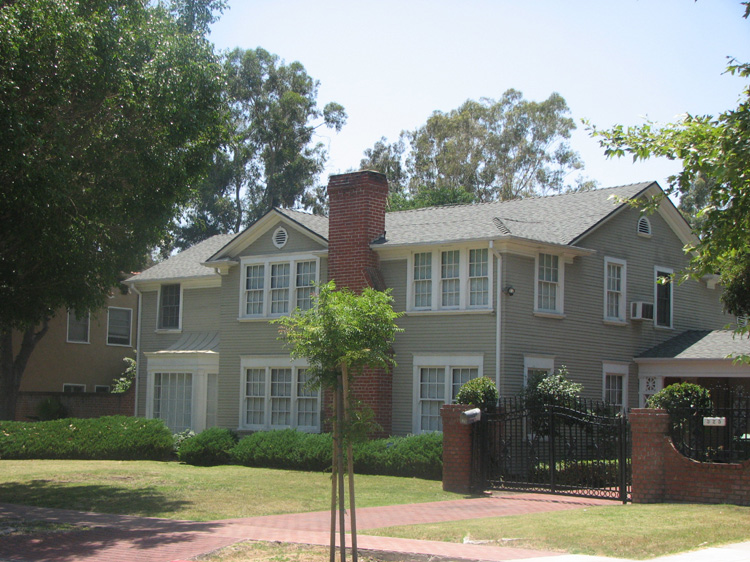 Irving sold the property to the Heermans in 1923. Over the next two decades, they molded the property into a full Hollywood estate by reworking the house and converting the chauffeur’s quarters in the original carriage house to an art studio, moving the utility room to the same, building a tennis court and a brick and wood pavilion for it, as well as a second brick garage and finally, a lath house for a special collection of cymbidium orchids that Heerman imported from his native England in 1942. The property remained the same until Victor Heerman’s death in 1977. It was sold shortly after that with the only subsequent change being the installation of a swimming pool in 1984. Historic brick walls are also there.